Notes:1. Read the pattern all the way through before beginning. 2. In the photo I alternated two rounds of each color. You can do as many as or as few color changes as you like. Since the color changes are personal choice I don’t tell you when to change colors in the instructions. 3. When changing color complete the last stitch of the round with the new color. Work in the ends as you go. See instructions for the way I handle color changes at bottom of instructions. 4. 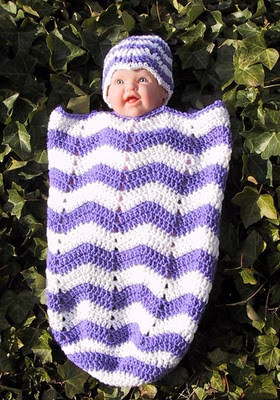 For the sleep sack in the photograph I used 3.6 ounces of the purple and 3.2 ounces of white. The cap used about .5 ounce of each color. 4. For scale my baby is 20 inches with a 14 inch head. Round 33: Slipstitch in next st, ch 1, sc in same stitch and next 4 sts. *Sc, ch 2, sc in next st, sc in 5 sts, skip 2 sts, sc in 5 sts. Repeat from * around. End round with sc, ch 2, sc in next st, sc in 5 sts. Color changes:What I do is; cut the yarn leaving a tail about 4 inches long. Then I join the new color yarn by completing the last pull through of the stitch with the new yarn. I work about 10 stitches, turn my work over and find the two tails. Adjust the tails so that the stitches are uniform at the join. Then I tie a square knot. I know lots of people say NO KNOTS. Well, I've been crocheting a long time and have been doing it this way more years than most of you have been alive and have never had a crocheted item come apart. Okay, now you have a knot near the top of your work, use your hook to weave one tail in and out of the back loop of your work about six times. Weave the other tail the opposite direction, also in the back loop. End your weaving with the yarn tails on the back side. Now crochet away. When you come to the woven section on your next round, crochet right over it like it isn't even there. When you are all finished go back and trim off the little tails that remain. You won't be able to see the join, and it will NEVER come undone. Thanks so much Suzie for sharing this pattern, it's really nice. Honestly you should consider publishing some of your patterns, I'm sure they would sell quite easily. Thanks for sharing your pattern. I have been wanting to make one of these in the ripple pattern. So cute! Thank you so much for sharing you sleep sack patterns. I have made one of each one for my granddaughter that is due in September... Per my daughter in laws request. These were so easy. Thanks for having this. I just found out my grandniece was born this morning (early) and now I know just what to make for her! Thanks for the great patterns, I made two baby sacks for my friends daughter, who's having twins. I posted a video of the made items on Youtube. Im apart of a group called FOTH(Fresh off the Hook) and we share all the cool items we make. You should check the video out cwatts7412(FOTH4) Thanks again, I let all of my friends know about you and your wonderful patterns. I love how concise this pattern is...I've had some difficulty in the past with ripples but you made it so easy...thank you! I just worked the first 4 roundsd and the problem isn't with the pattern. After completeing round 2 do you have 6 groups of (2dc, ch1, 2dc)? On round 3 you should be working in the dc next to the ch 1 spaces. Skipping the double crochets on the outside of the group. Hope that makes sense. I you want to send me a photo of your cap I will look at it and see what you are doing wrong. I have made the ripple for my great grandbaby to be and just LOVE it. The pattern was very easy to follow. I plan on starting the blue knitted cable cacoon and hat. I would love to do he green and blue stripe cacoon that is picure with the pink and purple ripple. If that pattern is available, where can I find it. That's not my photo or pattern. Sleep sack looks lovely in variegated yarn, nice stitch pattern too. I love it. I see two different sleep sack pictures but only one pattern, is there any way to get the pattern for the light green and purple sack ? I made the ripple one in pink and white and am about to make the hat right now ! I love this pattern ! The picture you referenced isn't mine. If I wanted to make this a few inches longer how would I do that? Thanks in advance this is my first try at a sleep sack.